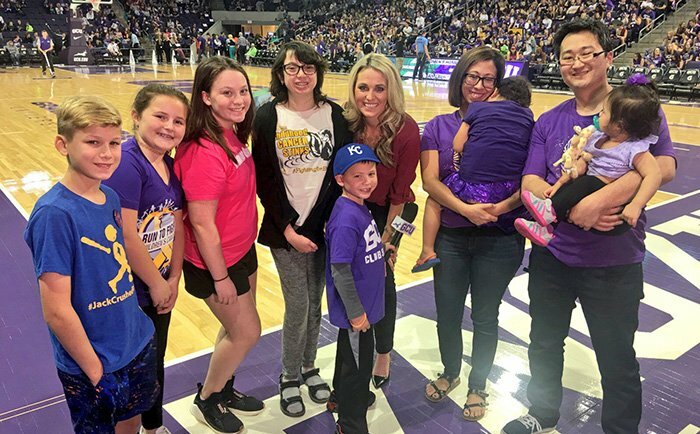 Six of the eight honorary race starters for Run to Fight Children’s Cancer gathered for a television interview at halftime. They are (from left) Jack Welch, Olivia Baumgardner, Grace Kostyk, Emma Kerr, Jace Hyduchak (in front) and Lily Gray (hiding her head on the shoulder of her mother, Lindsey). Also pictured are TV reporter Kate Longworth (behind Jace) and John Gray with daughter Lincoln. It dawned on Sue Kostyk just the other day. 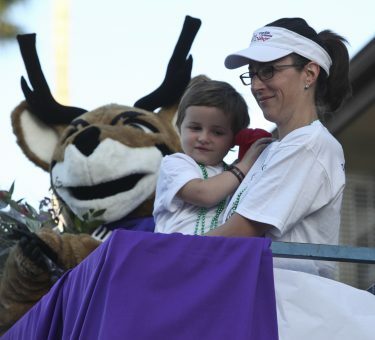 “I really feel like this year is the first year I actually have been able to find myself, who I am outside of ‘that cancer mom,’” she said. Grace Kostyk readied the horn on the day when she was the race starter. For Gretchen Baumgardner, the trauma of the cancer fight was relived yet again when she and her family volunteered to wrap presents that the Children’s Cancer Network would be handing out at Christmas. So much time has passed. So much has changed. 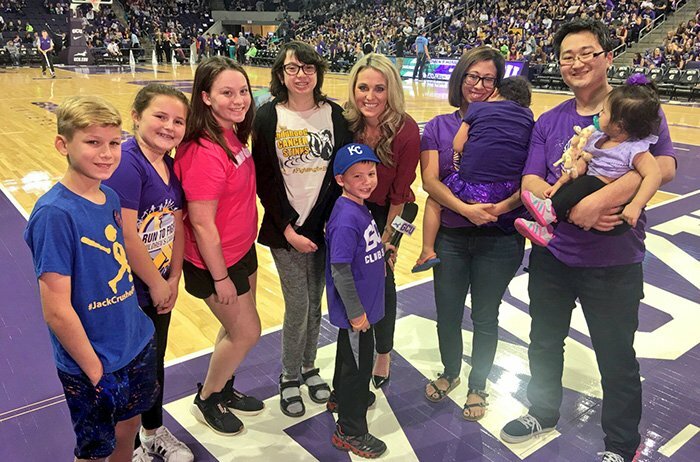 Both of their daughters – Grace Kostyk, 12, and Olivia Baumgardner, 10 – have been in remission for a while. 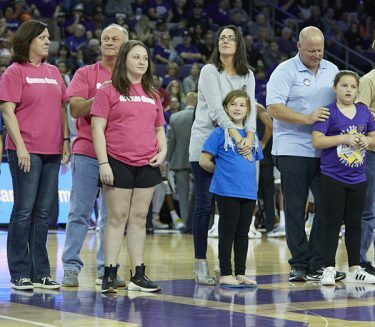 But the reality of pediatric cancer was evident yet again Saturday when six of the eight race starters for Run to Fight Children’s Cancer were on hand for Run to Fight Night at the Grand Canyon University men’s basketball game: Even when you put cancer in your rear-view mirror, it’s always somewhere in that traffic behind you. 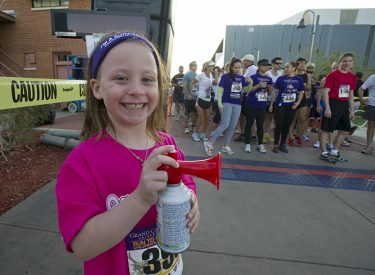 Grace and Olivia were the honorary starters in the first two years of the race, whose eighth edition is scheduled for March 10 at GCU. All proceeds go to the Children’s Cancer Network and Phoenix Children’s Hospital. Olivia Baumgardner with mom Gretchen and Thunder on her big day at the race. Both girls were around kindergarten age when they were diagnosed with leukemia, the most common childhood cancer. That might seem like too young to vividly remember everything that happened, but their memories are crystal clear – and so is their ability to talk about it. And how often does she think about it now? Both keep busy with numerous activities – Grace mainly with dance and basketball, Olivia with soccer and softball. They are catching up after all those years where their main activities were cancer treatments. But, most important, both are eager to be advocates for the children following in their fateful footsteps. Olivia took great joy recently in her first opportunity to volunteer at PCH – she made lip balm and bath salts, did girls’ makeup and wrapped presents – and plans to be an advocate for the rest of her life. “It feels good to give back to people who have cancer like I did and to give to someone who’s going through what I was going through,” she said. Families also go through a lot, which is why the Children’s Cancer Network exists. It’s like adding new members to a family that needs all the help it can get – from CCN, friends, extended family, anyone with a giving heart. “It’s been very eye-opening as to how people step up into this fight of cancer,” said Olivia’s dad, Mike Baumgardner. “People that we never thought would step up, that we didn’t know, were some of the people who stepped up the most. Sue Kostyk talked of how Grace is an atypical preteen, long on awareness and short on drama. That’s another thing cancer does to you – it’s the ultimate reality check. Jan. 23 is the five-year anniversary of the end of Olivia’s chemotherapy treatments –a big milestone for someone in remission. Grace is a little further along, but she’s still getting used to her new life. “For 2½ years it was all about treatment and her as the center of attention at home and at school. She’s had to learn how to be another kid. ‘Wait a minute, why am I not getting all the attention now?’” Sue said, laughing. These days, the Kostyks and Baumgardners are more than happy to shower the attention on other cancer patients. They’re creating new memories, but the old ones are never more than an unexpected teardrop away.